The Gilgamesh Epic (650-700 BC) is the Babylonian version of a Mesopotamian flood account. Translated by George Smith, the account is recorded on Tablet XI and is similar to the account found in the earlier Sumerian tablets (2000 BC) and Atra-hasis Epic (1646-1626 BC). It is often cited as the basis for Genesis account of the Flood (Genesis 6, 7, 8, and 9). Note carefully the seaworthiness of Gilgamesh's vessel and other details of his account; does the account sound realistic? In a quest for immortal life, Gilgamesh searches for the immortal Utnapishtim. Taken over water by the ferryman Urshanabi, Gilgamesh meets Utnapishtim who reveals why he is immortal: he escaped the flood sent by the gods, and he begins to recount his story. Speaking from behind a wall, the god Ea (Enki) warns Utnapishtim about the impending flood and instructs him to tear his home down and build a boat in the shape of a cube. He was also directed to "make all living things go intol his boat" Utnapishtim builds the boat in 2 days and the flood starts the next day. The gods escape to heaven and grieve at the loss of humanity. The flood lasted 7 days and nights where upon Utnapishtim’s boat rests on Mount Nimush. After 7 more days, Utnapishtim sends his birds out to see how the flood is receding. He makes an offering to the gods who are attracted to his sacrifice. Discovering that humans survived the flood, the god En-lil is furious, but admits that famine would be a better way of controlling mankind’s population. En-lil decides to bless Utnapishtim and his wife with immortality. does not identify the words with questionable translation. "I have been looking at you, but your appearance is not strange--you are like me! You yourself are not different--you are like me! My mind was resolved to fight with you, but instead my arm lies useless over you. Tell me, how is it that you stand in the Assembly of the Gods, and have found life!" its length must correspond to its width. Roof it over like the Apsu. Just as dawn began to glow the land assembled around me - the carpenter carried his hatchet, the reed worker carried his (flattening) stone, ... the men ... The child carried the pitch, the weak brought whatever else was needed. On the fifth day I laid out her exterior. It was a field in area, its walls were each 10 times 12 cubits in height, the sides of its top were of equal length, 10 times It cubits each. I laid out its (interior) structure and drew a picture of it. I provided it with six decks, thus dividing it into seven (levels). The inside of it I divided into nine (compartments). I drove plugs (to keep out) water in its middle part. I saw to the punting poles and laid in what was necessary. Three times 3,600 (units) of raw bitumen I poured into the bitumen kiln, three times 3,600 (units of) pitch... into it, there were three times 3,600 porters of casks who carried (vegetable) oil, apart from the 3,600 (units of) oil which they consumed (!) and two times 3,600 (units of) oil which the boatman stored away. I gave the workmen ale, beer, oil, and wine, as if it were river water, so they could make a party like the New Year's Festival. ... and I set my hand to the oiling(!). The launching was very difficult. They had to keep carrying a runway of poles front to back, until two-thirds of it had gone into the water. whatever silver I had I loaded on it, whatever gold I had I loaded on it. All the living beings that I had I loaded on it, I had all my kith and kin go up into the boat, all the beasts and animals of the field and the craftsmen... I had go up. In the morning he let loaves of bread shower down, and in the evening a rain of wheat. I watched the appearance of the weather--the weather was frightful to behold! I went into the boat and sealed the entry. For the caulking of the boat, to Puzuramurri, the boatman, I gave the palace together with its contents. Just as dawn began to glow there arose from the horizon a black cloud. Adad rumbled inside of it, before him went Shullat and Hanish, heralds going over mountain and land. Erragal pulled out the mooring poles, forth went Ninurta and made the dikes overflow. The Anunnaki lifted up the torches, setting the land ablaze with their flare. Stunned shock over Adad's deeds overtook the heavens, and turned to blackness all that had been light. The... land shattered like a... pot. All day long the South Wind blew ..., blowing fast, submerging the mountain in water, overwhelming the people like an attack. No one could see his fellow, they could not recognize each other in the torrent. The gods--those of the Anunnaki--were weeping with her, the gods humbly sat weeping, sobbing with grief, their lips burning, parched with thirst. Six days and seven nights came the wind and flood, the storm flattening the land. When the seventh day arrived, the storm was pounding, the flood was a war--struggling with itself like a woman writhing (in labor). The sea calmed, fell still, the whirlwind (and) flood stopped up. I looked around all day long--quiet had set in and all the human beings had turned to clay! The terrain was as flat as a roof. I opened a vent and fresh air (daylight!) fell upon the side of my nose. I fell to my knees and sat weeping, tears streaming down the side of my nose. I looked around for coastlines in the expanse of the sea, and at twelve leagues there emerged a region (of land). On Mt. Nimush the boat lodged firm, Mt. Nimush held the boat, allowing no sway. One day and a second Mt. Nimush held the boat, allowing no sway. A third day, a fourth, Mt. Nimush held the boat, allowing no sway. A fifth day, a sixth, Mt. Nimush held the boat, allowing no sway. When a seventh day arrived I sent forth a dove and released it. The dove went off, but came back to me; no perch was visible so it circled back to me. I sent forth a swallow and released it. The swallow went off, but came back to me; no perch was visible so it circled back to me. I sent forth a raven and released it. The raven went off, and saw the waters slither back. It eats, it scratches, it bobs, but does not circle back to me. Then I sent out everything in all directions and sacrificed (a sheep). I offered incense in front of the mountain-ziggurat. Seven and seven cult vessels I put in place, and (into the fire) underneath (or: into their bowls) I poured reeds, cedar, and myrtle. The gods smelled the savor, the gods smelled the sweet savor, and collected like flies over a (sheep) sacrifice. "Now then, who will convene the gods on your behalf, that you may find the life that you are seeking! Wait! You must not lie down for six days and seven nights." Soon as he [Gilgamesh] sat down (with his head) between his legs sleep, like a fog, blew upon him. "Look there! The man, the youth who wanted (eternal) life! Sleep, like a fog, blew over him." "Touch him, let the man awaken. Let him return safely by the way he came. Let him return to his land by the gate through which he left." "Mankind is deceptive, and will deceive you. Come, bake leaves for him and keep setting them by his head and draw on the wall each day that he lay down." She baked his leaves and placed them by his head and marked on the wall the day that he lay down. The first loaf was dessicated, the second stale, the third moist(? ), the fourth turned white, its ..., the fifth sprouted gray (mold), the sixth is still fresh. the seventh--suddenly he touched him and the man awoke. "Look over here, Gilgamesh, count your leaves! You should be aware of what is marked on the wall! Your first loaf is dessicated, the second stale, the third moist, your fourth turned white, its ... the fifth sprouted gray (mold), the sixth is still fresh. The seventh--at that instant you awoke!" "May the harbor reject you, may the ferry landing reject you! May you who used to walk its shores be denied its shores! The man in front of whom you walk, matted hair chains his body, animal skins have ruined his beautiful skin. Take him away, Urshanabi, bring him to the washing place. Let him wash his matted hair in water like ellu. Let him cast away his animal skin and have the sea carry it off, let his body be moistened with fine oil, let the wrap around his head be made new, let him wear royal robes worthy of him! Until he goes off to his city, until he sets off on his way, let his royal robe not become spotted, let it be perfectly new!" Urshanabi took him away and brought him to the washing place. He washed his matted hair with water like ellu. He cast off his animal skin and the sea carried it oh. He moistened his body with fine oil, and made a new wrap for his head. He put on a royal robe worthy of him. Until he went away to his city, until he set off on his way, his royal robe remained unspotted, it was perfectly clean. Gilgamesh and Urshanabi boarded the boat, they cast off the magillu-boat, and sailed away. "Gilgamesh came here exhausted and worn out. What can you give him so that he can return to his land (with honor)!" "Gilgamesh, you came here exhausted and worn out. What can I give you so you can return to your land? I will disclose to you a thing that is hidden, Gilgamesh, a... I will tell you. There is a plant... like a boxthorn, whose thorns will prick your hand like a rose. If your hands reach that plant you will become a young man again." Hearing this, Gilgamesh opened a conduit(!) (to the Apsu) and attached heavy stones to his feet. They dragged him down, to the Apsu they pulled him. He took the plant, though it pricked his hand, and cut the heavy stones from his feet, letting the waves throw him onto its shores. "Urshanabi, this plant is a plant against decay(!) by which a man can attain his survival(!). I will bring it to Uruk-Haven, and have an old man eat the plant to test it. The plant's name is 'The Old Man Becomes a Young Man.'" Then I will eat it and return to the condition of my youth." At twenty leagues they broke for some food, at thirty leagues they stopped for the night. Seeing a spring and how cool its waters were, Gilgamesh went down and was bathing in the water. A snake smelled the fragrance of the plant, silently came up and carried off the plant. While going back it sloughed off its casing. "Counsel me, O ferryman Urshanabi! For whom have my arms labored, Urshanabi! For whom has my heart's blood roiled! I have not secured any good deed for myself, but done a good deed for the 'lion of the ground'!" Now the high waters are coursing twenty leagues distant,' as I was opening the conduit I turned my equipment over into it (!). What can I find (to serve) as a marker for me! I will turn back (from the journey by sea) and leave the boat by the shore!" At twenty leagues they broke for some food, at thirty leagues they stopped for the night. They arrived in Uruk-Haven. "Go up, Urshanabi, onto the wall of Uruk and walk around. Examine its foundation, inspect its brickwork thoroughly--is not (even the core of) the brick structure of kiln-fired brick, and did not the Seven Sages themselves lay out its plan! One league city, one league palm gardens, one league lowlands, the open area of the Ishtar Temple, three leagues and the open area of Uruk it encloses. This ends Tablet XI. 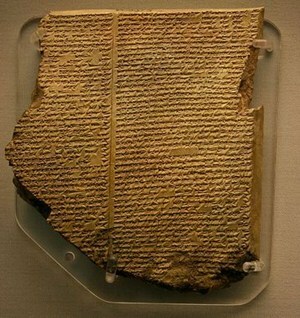 The Epic of Gilgamesh continues with Tablet XII which can be easily found on the Internet.